It is our experience that many companies are unaware of the significant tax saving incentive that is available. The R&D tax credit is often overlooked by organisations that do not normally associate R&D with their business or industry. Many of our clients used to regard their day-to-day business as “just doing my job”, when in fact they have been continually performing R&D qualifying activities. That is, employing staff directly who are actively engaged in carrying out R&D itself. The staff must be employed under a contract of employment directly with your company or organisation – not consultants, agency workers, or staff/directors whose contracts of employment are with other companies. However, these others may qualify under either the rules for staff providers or subcontractors. Paying a staff provider for staff provided to the company who are directly and actively engaged in carrying out R&D. The staff provider needs to contract with the individual whose services they supply – not through another person. Consumables or transformable materials used directly in carrying out R&D. The cost of relevant payments to subjects of clinical trials. Power, water, fuel used directly in carrying out R&D. Computer software used directly in the R&D. If your company is claiming relief under the SME Scheme, then you may be able to claim back 65% of what you spend on certain R&D activities carried out for you by a subcontractor. But if the subcontractor is connected to your company or organisation, or you have jointly elected for connected parties treatment, special rules apply. 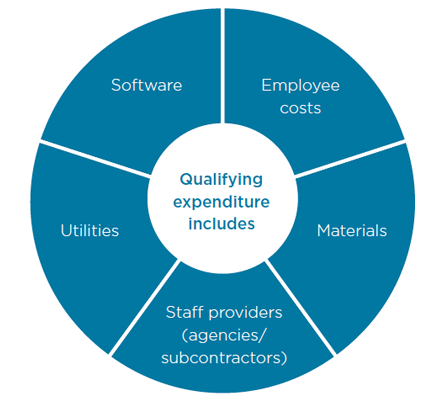 If your company or organisation is not a SME, you can only claim expenditure on activities that are undertaken directly on its behalf by certain specific kinds of subcontractor.